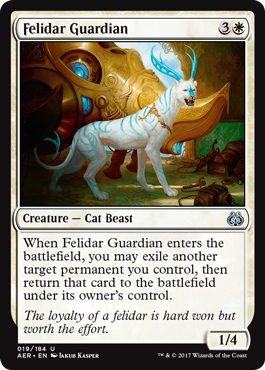 Felidar Guardian is going to enable [at least] one new infinite combo in Standard. New busted engines and combo decks in Standard! A new world order from at least two different directions! Gitaxian Probe: This card probably had it coming for a long time; it’s hard to balance any card that costs exactly [only] one Phyrexian blue mana. It mostly just drew you into your Become Immense while reducing its mana cost for free. Infect will remain super viable (but will have lost a little juice, which is justifiable), but the jury is out on Death’s Shadow, Storm, etc. Mike predicts the big winner will be Affinity. Golgari Grave-Troll: When this was recently un-banned, Cathartic Reunion had not yet been printed. Don’t look for Dredge to die completely in Modern. There are plenty of Dredge cards to replace this card, just at a downgrade. The graveyard will be “fine” … Just a little less powerful (which is fine). Emrakul, the Promised End: “She is the problem.” -Patrick. If there were only one card to be banned, this would have definitely been the one. Smuggler’s Copter: If you were only going to ban two cards, it should have been Emrakul and this one (so WotC got that right). Smuggler’s Copter, remember, is the first card in years to post thirty-two (32!!!) copies in a single Top 8. Reflector Mage: Patrick’s argument around this ban is perfect and you really just have to listen to it. Reflector Mage isn’t the intuitive right choice for blunting U/W (heck, they don’t even always play it, as it has neither Flash nor Flying), but it is not only perfect but a contextually better choice than Spell Queller. Trust us… err… Patrick, rather. The spoiling of Felidar Guardian has caused unprecedented interest in Saheeli Rai. If for no other reason than that, banning this new card prior to Pro Tour Aether Revolt would be a disaster. So, they didn’t. The simple combo is turn three Saheeli Rai, turn four Felidar Guardian. Saheeli Rai copies Felidar Guardian (with haste), the Felidar Guardian blinks and resets Saheeli Rai; rinse, repeat, attack for a ton. The combo can also be accomplished cleanly on turn six by playing Felidar Guardian and blinking a land (so your two mana becomes three, or enough to cast Saheeli Rai). Infinite again. Whether this combo wins Pro Tour Aether Revolt or not remains to be seen… But it will certainly be something Pros will be thinking about.